Strategic risks are a critical consideration for organizations in today’s marketplace. Internal audit’s role in addressing them and ability to audit them will only increase in importance as markets evolve. 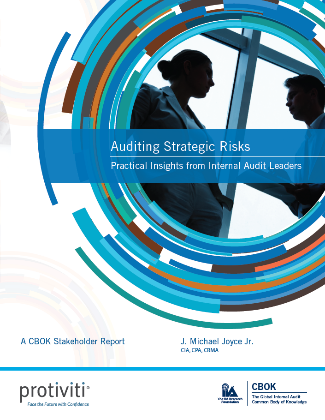 In the newest Stakeholder Report issued from research conducted from the 2015 Global Internal Audit Common Body of Knowledge (CBOK) Stakeholder Study, all signs point to an increased role for internal audit, with nearly two-thirds of stakeholders (64 percent) saying they want internal audit to be more active in strategic risks. The 12-page report highlights best practices for auditing strategic risks and discusses how leading CAEs around the globe are validating their seat at the decision-making table. From C-level executives to staff-level internal auditors, this quick-read report will give readers a good gauge of global stakeholder expectations so they can begin the conversation with their own stakeholders to align expectations regarding internal audit’s role in strategic risks.